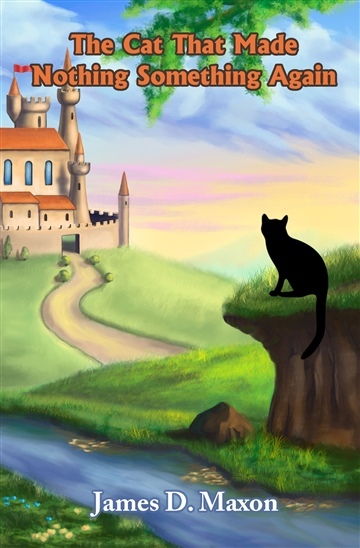 The Cat that Made Nothing Something Again is a whimsical story for children about a nameless cat that is bored in a land of dry everything – people, trees and land. He remembers a time when the landscape was green, flowers bloomed and people cared about him and each other. Wanting to experience the joy he remembers so well, he sets out on a journey to find the ones who sucked the moisture from his world and get it back. Along the way, he meets some colorful characters, including a wise old turtle, a seemingly sinister troll, a smart little bird, an overwhelmed mayor and a simple seed who reminds him how important it is for people to do what's right and take care of each other. Good wins out over evil in the end, but in a most unusual way. Anyone who has ever owned a house cat will appreciate the irony in the villains' demise. James D. Maxon (1977-Present) was born at Elmendorf Air Force Base in Anchorage, Alaska. His parents were divorced when he was just three-years-old. Raised in a strictly female household, James grew up in the midst of mental illness and depression. He, himself, struggled in school due to a learning disability. Without a positive male role model, James learned how difficult it can be for children to realize their true potential. Having acquired a love for fantasy at a young age, he began to write stories of his own, providing children and teens with messages of faith, hope, and insight. Overcoming his disability, James graduated college with a 4.0 GPA. He deepened his connection to the creative world by following a career in design. He now lives with his wife and daughter in a suburb of Minneapolis, Minnesota, and spends much of his free time applying his imagination to the real world.